So I pledged forever ago at 20$ and essentially stopped using the patreon.itmejp.com page. I just went and authorized it to just check out the new Zine, but nothing showed up. I figured I’d post here, I logged out and back in, refreshed the page, tried it on another browser (Firefox, original was chrome) and nothing. I really only posted because I was curious if it’s because I’m in a non-standard tier (the 20$ tier no longer exists) - because I thought that’d be funny. 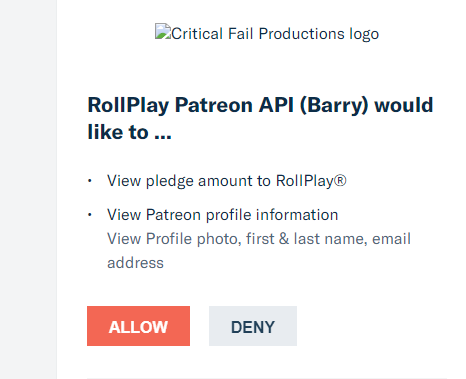 Also in chrome the logo on the authorize patreon page is broken. I just pledged at the $5 level today and got the same thing. I was in the middle of downloading some of the mp3’s and then it brought up the same errors you have, so it’s not just you. Not sure what’s going on yet. Check in your settings for Rewards that you are still signed up for one of them. I’m donating a custom amount on another Patreon and had to manually choose to be in a specific tier. I looked for a way to stay at $20 and choose a tier - but it didn’t seem like there was a way - so I switched to the $10 tier and i’m still having the same issue. Edit: Before I get called a noob for not reading - When i pledged 20$ was a reward tier - i must have been moved to custom when the restructuring occurred. Same issue at 5 dollar tier for me. Yeah I just checked. I have no access either at the 5 dollar tier. Must be something wrong on their end. Yup, I’m in the same situation. I have access at the 10$ tier again so maybe everything is fixed. For science i bumped my pledge back up to 20$ to see if i can access it but I think i have to wait for the next renewal for it to take effect. So RIP science. Edit: I forgot to click update pledge. I switched to the 20$ tier and it seems like I still have access, so must have just been related to whatever was going on with other tiers.